“It all begins with a great song,” says singer-songwriter Ben Reno and he enjoys doing it all. This multi-talented Californian writes his own music, sings, performs, and plays guitar, drums, banjo, bass and keyboards. 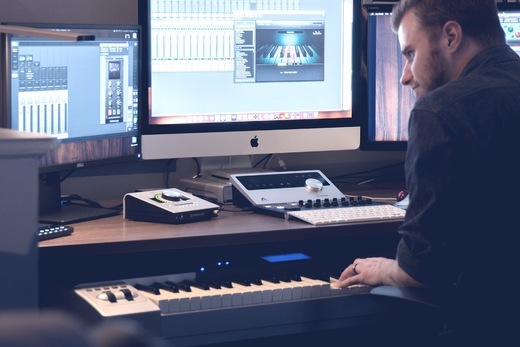 In addition to being an accomplished composer, singer and musician, Reno was the youngest person in the country to become a certified operator by Digidesign Company in the use of their Protools digital audio recording software and hardware. He recalls, “the training was pretty intense but I hung in there.” I received the best training of my life and learned so much from industry veterans like mixing master, Ed Seay.” “It’s all the little things and tricks that they do that make a great record.” Reno has produced or co-produced on all of his recordings to date. Growing up in Southern California with music all around him, Reno has musical family roots that span four generations. He began his music journey at the age of 5 when he got his first drum set for Christmas and years later played with the school jazz band and church worship team. He discovered one of his father’s guitars at the age of 12. The rest was history when he realized he could write his own songs with the guitar. He recalls thinking “it is very hard to write a song while beating on the drums”. “The guitar is so portable and is like my best friend.” The inspiration for his writing comes from real life personal experiences. “It’s a release of my emotions,” Reno says. With lyrical collaboration from a close friend and the producing genius of music giant, Paul Taylor, one of Ben’s personal favorite songs, “Everytime I Cry” was born. He loves to entertain and is a natural on stage as well as in front of the camera. His first music video “California Sun” filmed by Nashville and LA’s best of the best, Fresh Films, is a fun example of this Californian’s ability to entertain his audience. In a very short time, Ben Reno as an independent artist has gained the respect and interest of many music industry executives around the country. Now located in Nashville he has been blessed by so many great friends and amazingly talented people. He is currently looking for more individuals that want to be a part of what he is doing and would like to be a vital member of his team. With the right promoters, backers, managers and booking agents on his team, Reno believes his goal to take his music to the entire world will be realized. Who knows, maybe you are one of those people. Ben would like to thank his many fans, myspace friends and family for their continued love, support and prayers and God for giving him the talent and passion to create his unique music.